Why are white people silent about racial trauma? I last wrote that white people are silent about racial trauma, because we care but we are inept. To the extent we have become aware, we know we are complicit. Some of us feel ashamed and that freezes us. We haven’t processed or practiced, what we might say. I still think this is true, about some of us. 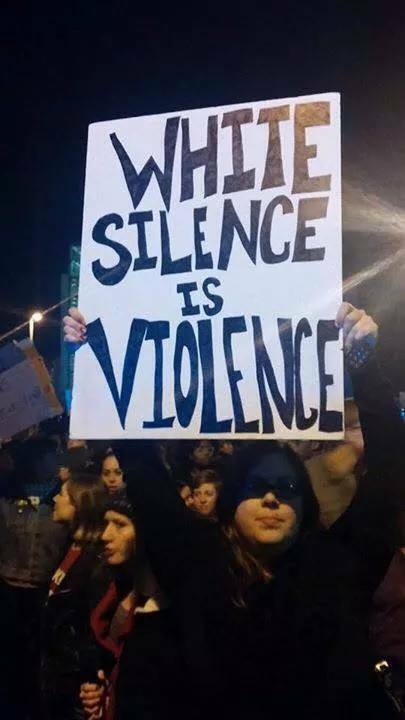 However, some white people are silent because they truly don’t care. I have a black friend, 60 something, who lost a cousin to gun violence. Talking to him today had me in tears. How can we not care? I know sometimes it’s “news” and not a friend. I know we experience compassion fatigue. Looking for insight, I’m reading a great book in pre-publication called Living in the Tension: The Quest for a Spiritualized Racial Justice by a white blogger named Shelly Tochluk, and I’ll review the advance copy and write about it in more detail when it is available for sale. Shelly apples on the work of some psychologists who study trauma, and she applies it to racial trauma for insight. Shelly argues that there are four positions people take around racial trauma. Her learning from the psychologists is that bystanders become disassociated from the pain they witness in trauma, and fundamentally do not care. -bystanders have “strong divisions between self and other… allowing people to feel distance from the racism and damage occurring within the US society.” (Tension, 59). They are disconnected from the beloved community God is creating. -bystanders obsessively rehearse violence… in films, video games, the news. Some people see racial violence and barely register. “The normalization of violence and subsequent lack of reactivity, allows a bystander to remain passive and fail to take action to create a safer community for all (p. 61). I think much of this means that as bystanders, we may become disconnected from our own capacity for empathy. I asked some white folk if any of this resonated, and they found it familiar. Sometimes they do feel disassociated from other people’s experiences of racism and their racial pain. What’s the solution? We can choose to move from being a bystander to becoming a witness. We can cultivate compassion. We can offer our empathy online or in person. We can call our friend and cry. We can join a street protest. We can take action to create a better society…. again, and again, and again. I was recently at a major institution in my denomination, and the national headquarters of an evangelical Christian non profit. At both places, people of color were talking about the fact that when they passed white people, most of us were silent. They felt effaced by our silence. Their very existence was ignored. I feel pretty sad about that, because these are our brothers and sisters and neighbors. So when I find myself inclined to being a silent introvert, I remember: Jesus was really clear that if we can’t love each other, we can’t pretend we love God. Making conversation is really not that hard, and it’s fun to find commonalities and make connections. But we white people of good intentions are also often silent online. Now I recently read a stinging analysis of white anxiety and hate politics, and it was hard work to respond. But we are also silent around tragedies. Why are white people silent around racial trauma? We read the news. We know black men are incarcerated. Black boys are being shot. Black women are underpaid and overworked. We know more Black and Latino people experience food insecurity, inequity in housing, education and employment. I think we are silent because, we care…. We are silent because we do care, and we don’t want to say the wrong thing. Maybe I’m saying, we care but we are incompetent? We need a racial education. We need to build skills for cross-cultural and interracial conversations. If we can talk to people of color about other topics, we can express our concern and stand up for the right thing when it is needed. We care, but we are ashamed. Sarah Shin first pointed this out to me. Doug and I talked in our book about white guilt. Sarah’s critique was that really we have a bigger problem with white shame. If we feel guilty that we have done something wrong, then the solution is fairly clear – we can make amends and do our best to set the situation straight, and we can ask forgiveness, to begin the process of reconciliation. But guilt and shame are different. When we feel ashamed, we don’t want anyone to know. We hide from ourselves and others. Shame freezes us. To the extent that white people are aware of our privilege, we know we are complicit in systems of racial inequity. Can you relate to that? Do you ever feel ashamed of being white? This is particularly challenging when other people perceive we need an education and try to educate us about race, justice and our complicity. It seems to me a lot of our attempts to educate others about race come with urgency – it is urgent – and with anger -and they may heap on more shame. I have to admit I do that. I recognize myself. My son is black and he goes to college in northern Wisconsin where it’s mostly white. Sometimes when he leaves home, I feel afraid that he’ll have another “driving while black” incident. The last time I told some of my church folks about my fear and my prayers for his life and safety, they were not able to listen to me, or say anything. They froze. And I confess I felt angry. So I’m still trying to learn to talk about race in a committed way, but with a great deal of compassion for each person. Every person is a beloved child of God, and has the capacity for great goodness. I’m coming to believe, what we need is empathy. Gentleness with our own growth process. And let us not forget, empathy for the violence that people of color face daily. We are growing, slowly; they are dying. You will be inviting an education. (That may come with kindness or it may come with some strong feelings.) But when people educate us, it is an opportunity to learn about the real situation for people of other races. And you may need to face your shame. Because ultimately, growing our empathy is important enough to lay aside our shame. David Couper is a Christian and former police chief who integrated his department and brought in the idea of community policing. After leaving active policing, he went on to become an Episcopal priest and he began to blog at Improving Police (where he now has 200,000 readers). We were fascinated to talk with David and learn more about his journey. Paula: I have a sense that the unwritten police code says that to challenge the police, is to betray them. How did you become willing to challenge your colleagues — and not only to challenge them, but to challenge them in public? David: I found out quite early the way the police subculture operates – critics of the police are first ignored, then if those critics gain some traction, the police start to say bad things about them. In my case it is that I was out of touch and just trying to make money on my recent book – not that my ideas were valid and worth consideration. Thankfully, my audience became not just police, but the community as well, for a great deal of what I propose for reform are steps citizens can take to help their police improve. 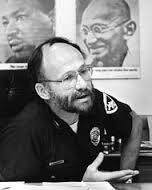 I always felt a part of that small, but passionate, group of fellow police officers who pressed for for needed reform. 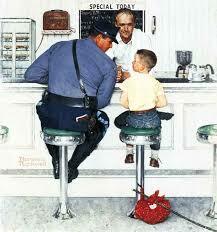 I began my police career in a suburb of Minneapolis and after two years went to the city police department. They hired a hundred of us in a few months. We were more educated people and younger, and we banded together against the subculture … which was getting drunk on duty, beating people up, and other negative behaviors. I knew that things had to change. Then I came to Madison, and thought this is a better culture but very traditional. But I quickly found my acceptance and survival was not to be in hands of the police department. I looked to the more liberal community and the broader Madison community, to help me along the way, which did in fact happen..
Really, the most dangerous time to be a police officer in America was the 1990s, when we started the drug war. We didn’t have protective gear; we didn’t have personal radios; our firearms only held 6 rounds. So when you got the call there was trouble, you couldn’t rely on being backed up. You had to negotiate and de-escalate the situation yourself..
That reminds me. The other day, no, really it was the middle of the night, about 3 am, we woke up because our street was full of police lights. All up and down, ten or fifteen cars, and a tank. It turns out some teenagers had taken a SUV on a joyride. Why are we using military equipment on teenagers, in a residential neighborhood? Well, you know. They’re symbolic terrorists. What key experiences have you had, to develop your philosophy? I used to work nights on the tactical squad in Minneapolis – it was called “The Flying Squad.” We reported directly to the #2 man in the police department.. All the time I was pursuing my BA at the University of Minnesota, then there was grad school. I was a major change-point in my life as I began to see the “big picture.” I had political activists in my seminars. In my studies I developed a sense of curiosity: who, where, what’s all this about? What IS the big picture here? Who is the ‘enemy’ in student protests? When I came to Madison in 1972 staff officers tried to tell me that students are dangerous and I need to stay away from them, not talk to them because “ they’ll try to kill you,” but I felt ​​quite comfortable talking to them and working with them on solutions. I knew what dangerous people were like from my time in Minneapolis. These were not dangerous people. This conversation with staff officers happened shortly after I became chief in Madison, I went to a student meeting and introduced myself. Again colleagues tried to say I took my life in danger, just going – but I know when I’m in danger, that was not a dangerous situation. I told the I questioned their intelligence sources. I quickly realized that the plan was to keep me away from the community, to get me to buy into the idea that student activists are dangerous. Instead, I put some of these activists on one of my community relations committees — why wouldn’t we want to do that? Talk to them, get to know them better. From the start, I had a vision that police protect our Constitutional rights, and when that’s your vision you approach the job a lot differently than police do today. I can to imagine police as social workers in blue; that they contribute to society, aid people in distress, and so forth. Some police seem to have that ideal now. There’s that old police motto: “protect and serve.” Still, I notice “protect and serve” being taken off some police cars around the nation – why is that? I’m not sure. Is servant leadership bad? Demeaning? I don’t think so. David, aren’t you the one who integrated the Madison Police Department? How’d you do that? First, we had to get them firearms, train them, let them know they had the same power as male officers, and then tell them they were eligible for promotion. One was interested, she went all the way up to assistant chief — Morlynn Frankey. When I retired from the department in 1993 there were 10% minority officers, and 25% women – it took twenty years to get those numbers. I would challenge my recruiters with this caveat, “If you don’t present to me a recruit class that was at least a 50% combination of women and minorities I will not give you the go ahead. For many years, Morlynn Frankey led our recruiting and training unit. She made sure this happened.. Most departments, even Madison, cannot attest to having a top management team of at least 20% women. It is needed. Getting unrepresented persons in the ranks is one thing – getting them into the board room is another. Promotions come much slower, so I had to bring people up through the ranks. When the department elected an officers advisory counsel, they elected all white males. So when I went to our first meeting, I said, it’s nice that you guys have all been elected, but what are we going to do about representing other folks in the department – women and minorities? I was able to convince them to go along with the idea of saying let’s having ‘at large’ representation from women and officers of color. And they went along with it. That’s how Chief Noble Wray got his start along with Capt. Cheri Maples went I brought them onto my top management team. We needed to hear their voices and perspectives. I think what I envision will take about a decade. If we keep pressing on to implement the recommendations of President Obama’s Task Force on 21st Century Policing, and the “30 Guidelines” of the Police Executive Research Forum (PERF) on use of force we will have restored trust and support in our nation’s police. And we cannot accept the current state of affairs where only one percent of our nation’s police departments require their incoming officers to hold a bachelor’s degree. This is simply unacceptable and was the recommendation of President Johnson’s Task Force on police over 40 years ago. Education and improvement have to go hand in hand. We must raise the bar on police use of deadly force in America and do it now. The idea of sanctity of life and raising the standard is in the PERF report and the President’s Task Force takes on the idea that police must be guardians and not warriors. If these ideas prevail during coming years I have great hope for the future. If I see that all I once dreamed of and hoped for the police will not have been realized I will be extremely sad. 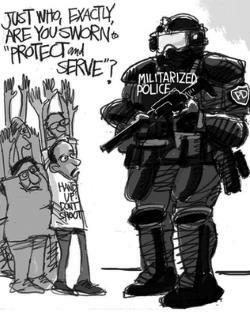 How do you reconcile your ministry with your police activism? I know being a social critic of a major institution like the police is often quite difficult. How did this unique combination emerge? My maternal grandmother lived with our family for many years and was very influential in my faith (she was a strong Episcopalian and a women who graduated from college in the late 1800s). She was an activist suffragette and a lot of that took root in me. Social justice was a major part of my life as a police leader and my Christian faith continues to push me in that direction in spite of the pushback I often receive from police who really don’t want to think about changing their training in and use of deadly force. I clearly have heard the cries from women of color in our country — “Stop killing our children.” I think police have a moral responsibility to adequately respond to their cries and I am committed to offer ways in which they can respond and rebuild trust of our nation’s police. This call which arises out of my Christian faith drives me to do this. Thank you David. May God bless you in both endeavors. Readers, you can find more of David’s prophetic work at his blog, Improving Police, or his newest book, Arrested Development. 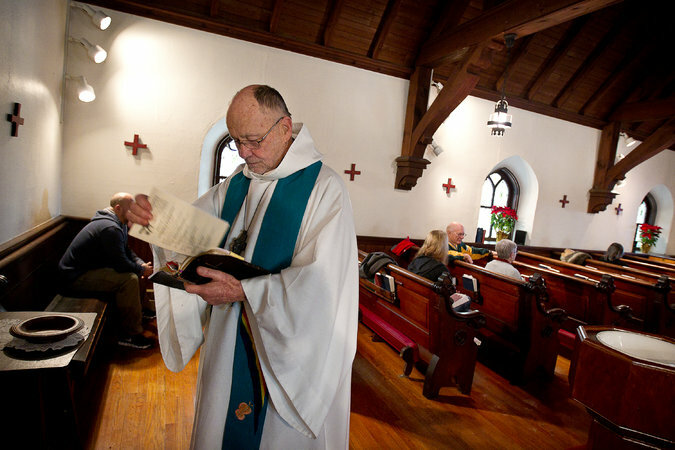 If you find yourself in the Lake Country of Wisconsin, he pastors St Peter’s Episcopal Church.